The Fife players celebrate after Anton Dowds' equaliser. 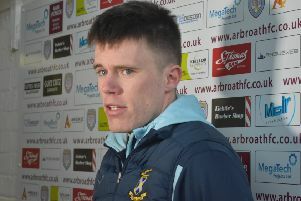 Darren Young says his Fife side will need to be at its very best for the remaining seven games of the season as they close in on the play-offs. Every team in the league has something to play for, with just seven points separating bottom from fifth. East Fife are free from relegation concerns this season and are aiming to cement their place inside the top four. But boss Young knows his side will have to earn every point they take, starting with Brechin City at Bayview this weekend. He said: “We’re at the stage of the season now where everyone has something to play for. “Brechin are still fighting down near the bottom, but we can only look after ourselves and go into the game looking to get the points on the board to push us further away from those behind us and closer to the teams above. 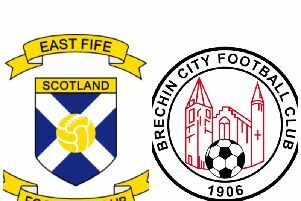 Saturday’s 2-1 defeat to champions elect Arbroath at Gayfield brought to an end a gruelling run of Saturday-Tuesday fixtures for the side. Young was left frustrated following the game, feeling that his side had done enough to take something from the game. Crucial decisions also went against his side, said the Bayview boss. “I’m disappointed that we haven’t taken at least a point,” said Young. “I’ve watched the game back and there’s a foul on Chris Higgins inside the box. Craig Watson suffered a serious injury during the first half of the game and is likely to be out for some weeks. • The Levenmouth Foodbank will be collecting supplies ahead of Saturday’s game. Fans are invited to contribute.